German Printmakers, 15th-17th Centuries: Heinrich Aldegrever, Jost Amman, Hans Sebald Beham, Hans Brosamer, Hans Burgkmair, Lucas Cranach, Albrecht Durer, Albrecht Durer (After), Augustin Hirschvogel, Hans Holbein (After), Hopfer Brothers, Georg Pencz, Hans Schaufelein, Virgil Solis, Wolfgang Stuber. Hendrik Goltzius, a brilliant printmaker, draftsman, painter, and the head of a workshop that dominated Dutch printmaking during the late 16th and early 17th centuries, is the first name most people think about when they think about the Dutch Mannerist movement. As the recent travelling exhibition at the Rijksmuseum, Amsterdam, The Metropolitan Museum of Art, New York, and The Toledo (Ohio) Museum of Art (and the massive accompanying book, Hendrick Goltzius (1558-11617): Drawings, Prints, and Paintings by Huigen Leeflang, Ger Luitjen and others, make clear, Goltzius, "favored by an emperor [Rudolph II] and other European sovereigns" is a artist of "exceptional versatility, quality, and importance" (p. 6). As an engraver, his technique was unmatched; as a designer of prints and a draftsman, he offered the definitive version of Dutch Mannerism; and his drawing-paintings filled his contemporaries with admiration and sill overwhelm viewrs (as the exhibition proved). 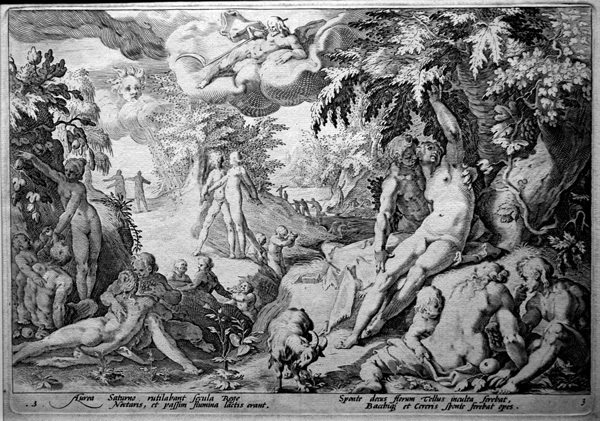 His designs for Ovid's Metamorphoses, engraved by members of his studio, set a pattern that dominated Dutch art into the mid-17th century, and his engravings for the Passion recapitulate Northern printmaking from Durer and Lucas van Leyden until Goltzius' own works. All of the engravings for the Passion illustrated here come from a set of 11 of the 12 plates we purchased at auction as a set. Many of these came from the collection of John S. Philips, whose collection was willed to The Pennsylvania Academy of Fine Arts, and bear the stamps of John S. Philips and The Pennsylvania Academy of Fine Arts (with their P.A.F.A stamp verso). These were subsequently acquired by the Philadelphia Museum of Art as part of their purchase of the P.A.F.A collection and sold at auction as surplus. Selcted Bibliography: Nancy Bialler, Chiaroscuro Woodcuts. Hendrik Goltzius (1558-1617) and his time (Amsterdam: Rijksmuseum, 1992); Frederick den Broeder, Hendrik Goltzius & the Printmakers of Haarlem (Storrs: Museum of Art, University of Connecticut, 1972); Stephen H. Goddard and James A. Ganz, Goltzius and the Third Dimension (Williiamstown: Sterling and Francine Clark Art Institute, 2001); Glenn Harcourt, Hendrik Goltzius and the Classical Tradition (Los Angeles: Fisher Gallery, University of Southern California, 1992); Otto Hirschmann, Verzeichnis des Graphischen Werks von Hendrick Goltzius 1558-1617 (Braunschweig: Klinkhardt & Biermannm 1976); Huigen Leeflang, Ger Luitjen and others, Hendrick Goltzius (1558-11617): Drawings, Prints, and Paintings (Amsterdam: Waanders Publishers, 2003); Eva Magnaguagno-Korazija, Hendrik Goltzius: Eros and Gewalt (Dortmund: Harenberg, 1983); Lawrence W. Nichols, The "Pen Works" of Hendrick Goltzius (Philadelphia: Philadelphia Museum of Art, 1992); Timothy Riggs and Larry Silver, Graven Images: The Rise of the Professional Printmakers in Antwerp and Haarlem, 1540-1640 (Evanston: Mary and Leigh Block Gallery, Northwestern University, 1993); Eleanor A. Saunders, Imitation and Invention: Prints by Hendrik Goltzius. Georgia Museum of Art Bulletin (Vol. 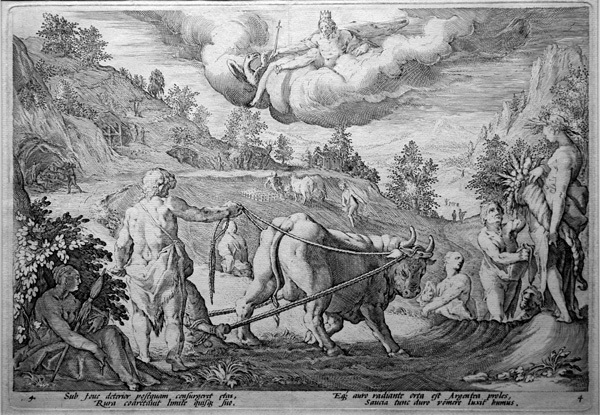 4, Numbers 1-3), 1978 (Athens: Georgia Museum of Art, University of Georgia, 1978); Walter L. Strauss, Hendrik Goltzius 1558-1617 The Complete Engravings and Woodcuts. 2 vols. (NY: Abaris Books, 1977; Walter L. Strauss, The Illustrated Bartsch Vol. 3: Hendrik Goltzius, (NY: Abaris Books, 1980). Prometheus creating man (B.32, TIB 0302.032). Engraving after Goltzius, 1589. Very good impression on laid paper for a series of engravings after Goltzius' drawings illustrating scenes from Ovid's Metamorphoses. The first 20 sheets were engraved in his workshop in 1589, the next 20 in 1590. Signed HG Excud in the plate; numbered 2 lower left. Thread margins all around. Image size: 173x255mm. Price: $2000. The Age of Gold (B. 33, TIB 0302.033). 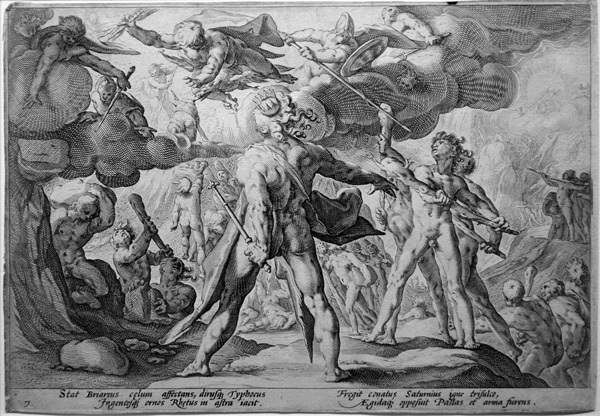 Engraving after Goltzius, 1589. A good impression on laid paper for a series of engravings after Goltzius' drawings illustrating scenes from Ovid's Metamorphoses. The first 20 sheets were engraved in his workshop in 1589, the next 20 in 1590. Ours is a later impression numbered 3 lower left and lower right. Thread margins all around. Image size: 173x255mm. Price: $1200. The Age of Silver (B. 34, TIB 0302.034). 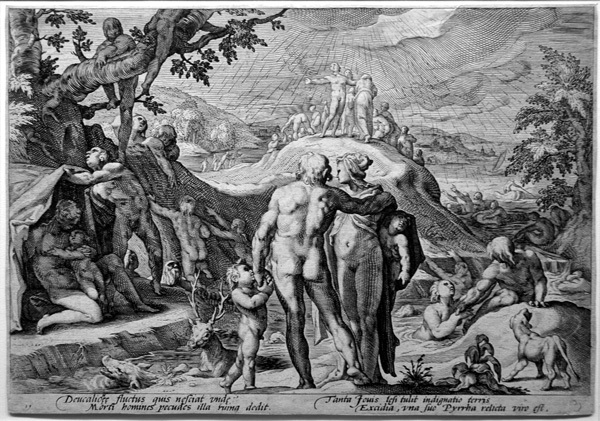 Engraving after Goltzius, 1589. A very good impression on laid paper for a series of engravings after Goltzius' drawings illustrating scenes from Ovid's Metamorphoses. The first 20 sheets were engraved in his workshop in 1589, the next 20 in 1590. Our impression numbered 4 lower left. Thread margins all around. Image size: 173x255mm. Price: $1900. The Age of Bronze (B. 35, TIB 0302.035). Engraving after Goltzius, 1589. A very good impression on laid paper for a series of engravings after Goltzius' drawings illustrating scenes from Ovid's Metamorphoses. The first 20 sheets were engraved in his workshop in 1589, the next 20 in 1590. Our impression numbered 5 lower left. Thread margins all around. Image size: 173x255mm. Price: $1900. The Giants Climbing the Heavens (B. 37, TIB 0302.037). 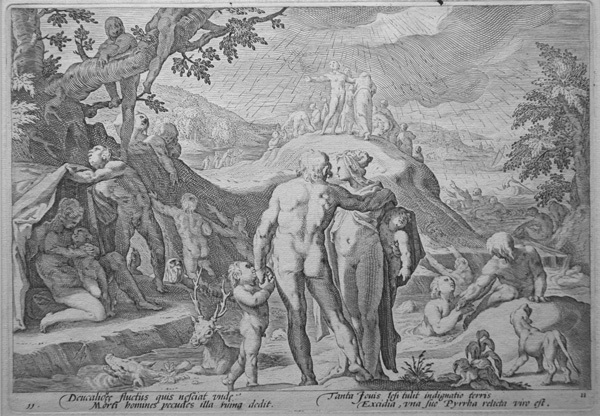 Engraving after Goltzius, 1589. A very good impression on laid paper for a series of engravings after Goltzius' drawings illustrating scenes from Ovid's Metamorphoses. The first 20 sheets were engraved in his workshop in 1589, the next 20 in 1590. Our impression numbered 5 lower left. Thread margins all around. Image size: 173x255mm. Price: $1900. 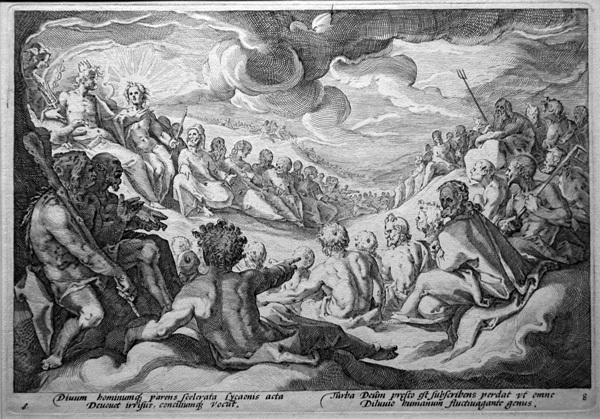 Jupiter taking counsel from the gods about the destruction of the universe (B. 38, TIB 0302.038). 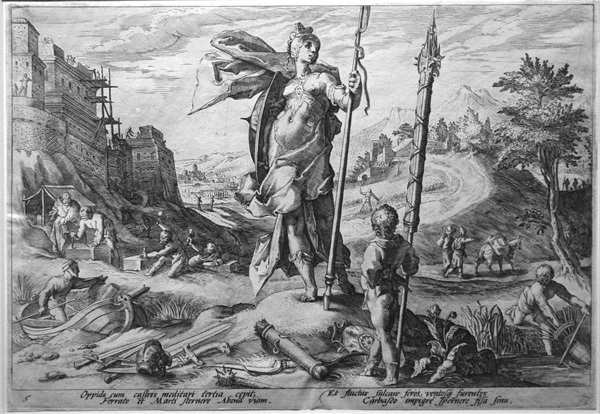 Engraving after Goltzius, 1589. A good impression on laid paper for a series of engravings after Goltzius' drawings illustrating scenes from Ovid's Metamorphoses. The first 20 sheets were engraved in his workshop in 1589, the next 20 in 1590. Ours is a later impression numbered 8 lower left and lower right. Thread margins all around. Image size: 173x255mm. Price: $1200. The Deluge (B. 41, TIB 0302.041). 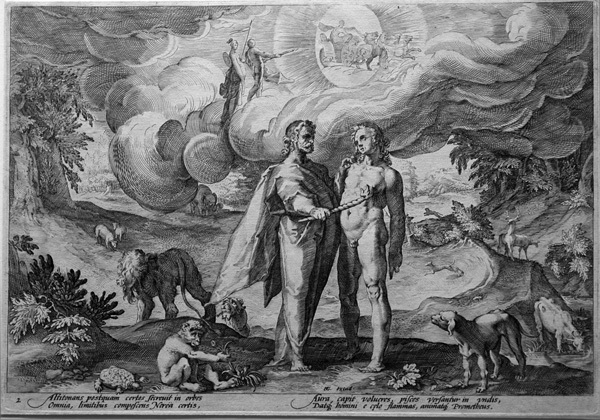 Engraving after Goltzius, 1589. A very good impression on laid paper for a series of engravings after Goltzius' drawings illustrating scenes from Ovid's Metamorphoses. The first 20 sheets were engraved in his workshop in 1589, the next 20 in 1590. Our impression numbered 5 lower left. Thread margins all around. Image size: 173x255mm. Price: $1900. The Deluge (B. 41, TIB 0302.041). Engraving after Goltzius, 1589. A good impression on laid paper for a series of engravings after Goltzius' drawings illustrating scenes from Ovid's Metamorphoses. The first 20 sheets were engraved in his workshop in 1589, the next 20 in 1590. Ours is a later impression numbered 8 lower left and lower right. Thread margins all around. Image size: 173x255mm. Price: $1200.